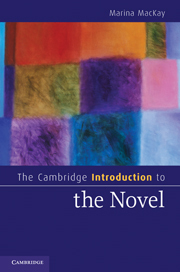 The Cambridge introduction to the novel / Marina MacKay. MacKay (English, Washington Univ., St. Louis) here makes a significant contribution to the understanding and appreciation of the novel, calling this a "book about what novels are and what they do." She explores the history of the form, which can be traced to classical antiquity or 18th-century England, depending on how one defines "novel." Each chapter explores a particular aspect of the novel, such as narration, character, and setting. Following each chapter is an accessible interchapter in which MacKay further explores that aspect through a specific novel, ranging from Don Quixote through some usual examples to Salman Rushdie's Midnight's Children. The chapters are largely self-contained, enabling the reader to focus quickly and effectively. In addition, a glossary of terms is provided, with first usage in the book bolded to signify that a definition is available. VERDICT With a wealth of information and examples, this book will enrich the understanding of undergraduates who use it as supplementary text. Also indispensible to teachers and any reader interested in the novel's evolution.-Anthony Pucci, Notre Dame H.S., Elmira, NY (c) Copyright 2011. Library Journals LLC, a wholly owned subsidiary of Media Source, Inc. No redistribution permitted. Beginning its life as the sensational entertainment of the eighteenth century, the novel has become the major literary genre of modern times. Drawing on hundreds of examples of famous novels from all over the world, Marina MacKay explores the essential aspects of the novel and its history: where novels came from and why we read them; how we think about their styles and techniques, their people, plots, places, and politics. Between the main chapters are longer readings of individual works, from Don Quixote to Midnight's Children. A glossary of key terms and a guide to further reading are included, making this an ideal accompaniment to introductory courses on the novel.